The world has a love-hate relationship with the original Ninja Gaiden series on NES. On the one hand, it's a cult classic series, but on the other, the games were frustrating as hell, particularly the original... but that hasn't stopped developers from mimicking this style with creations of their own. 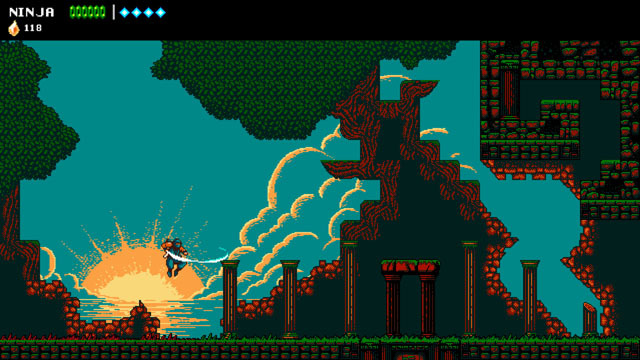 Enter The Messenger from developer Sabotage Studio and publisher Devolver Digital. The game offers similar visuals to Ninja Gaiden but gives the player a more capable hero. In addition to basic platforming, sword slashing, and shuriken tossing, the ninja can unlock new gear that allows him to swim underwater, use a grappling line to draw himself toward walls or enemies, and even use a cape to ride air currents to reach higher platforms or attack enemies from above. A robust skill tree allows players to select upgrades to increase their effectiveness in combat, or add to their navigational abilities to explore the open environments and discover secrets. Players can even shift forward in time, and the graphics shift along with them, offering enhanced visuals and audio more in line with the 16-bit era, and shifting between timelines allows players to take advantages to changes in the environment between eras. The game is coming to PC, Switch, PS4, and Xbox One later this year.